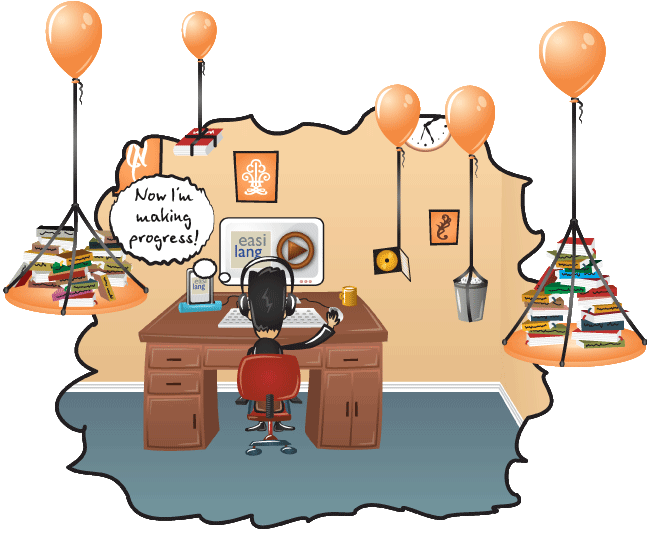 Easilang uses these tools and has created a collection of stories to provide an enjoyable way to learn and understand the language you are seeking to study. The story is read to you so that, quite effortlessly, you will at the same time know how to pronounce the words and understand them when you hear them. The translation is a living dictionary, translating the words of the stories into their meaning in that particular sentence. Any word may well have a different translation in a different context in another book or another part of the same book. You will soon pick up these differences and unlike an ordinary dictionary, you will never have a doubt as to its meaning. The faint background music has the effect of subliminally increasing the mind`s absorption powers of the learning material. The more often you read any book, the better your understanding of the words and expressions, and you will very quickly notice how much you have learnt by your decreasing use of the translation. By this system you do not need to start with simple language and then go on to more difficult words and sentences. The only words you will not understand are the ones that you do not know in your mother tongue. These are likely to be few and far between. The system can be used on your desktop, laptop, ipad, smartphone and most popular devices. As you do not need to be connected to the internet once you have downloaded any book, you can use it wherever you are and whenever you have any spare time, however short.